For other uses, see Korach (disambiguation). Death of Korah, Dathan and Abiram, Gustave Doré, 1865. Korah or Kórach (Hebrew: קֹרַח, Standard Kórakh Tiberian Qōraḥ; "Baldness; ice; hail; frost" (Arabic: قارون) is a name which is associated with at least two men in the Hebrew Bible. Some older English translations, as well as the Douay Bible, spell the name Core, and many Eastern European translations have Korak. According to the Book of Genesis 36:5, Korah was the son of Esau and Aholibamah, and had two brothers, Jeush and Jaalam. Genesis 36:14 has Korah's mother, Aholibamah, being daughter of Anah, and granddaughter of Zibeon, making Zibeon Korah's maternal great grandfather. The same verse repeats Genesis 36:5 and names his two brothers again. Anah in Genesis 36:2,14,18,25 mentioned above is the same as the Anah, the son of Zibeon in verse 24. In verse 2 and 14 it says, "Aholibamah the daughter of Anah, the daughter of Zibeon the Hivite;." Some are confused with this wording and believe that it is saying that Anah is a daughter of Zibeon. In verse 24 it clearly says that Zibeon's two sons were Ajah and Anah. Since the original text does not have a literal word for "grand daughter" the word "bath" was used in both cases. But this sentence is stating that Aholibamah is the daughter of Anah and the "granddaughter" of Zibeon, not that Anah is the daughter of Zibeon. Esau had multiple wives and Korah is also listed as a grandson of Esau through Eliphaz, causing some confusion. Esau and his wife Adah bore Eliphaz. Genesis 36:16 states that Eliphaz bore a number of sons (called here, dukes) that came from his son Eliphaz, and one of them is Duke Korah. It is not unreasonable that Esau had a son and a grandson named Korah. However, it is more accurately viewed as, a grandson is a son. Exodus 6:24 And the sons of Ko'rah; As'sir, and El'kanah, and Abi'asaph: these are the families of the Kor'hites. The Punishment of Korah and the Stoning of Moses and Aaron. 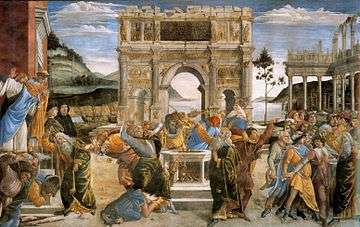 Fresco by Sandro Botticelli in the Sistine Chapel, 1480-82. Exodus 6:21 cites another Korah as being the son of Izhar son of Kohath son of Levi. Korah's brothers through Izhar were Nepheg and Zichri. Exodus 6:18 connects this Korah with Hebron, Uzziel and Amram, who were his father's brothers (Izhar son of Kohath). 1 Chronicles 6:2,18,38, and 23:12, repeat this genealogy; however, this reference could have been inspired by the Exodus genealogies. Hebron is the patriarch from whom the region is named. Numbers 16:1 traces this lineage back further to Levi, son of the patriarch Israel. According to Numbers 16:21, his lineage goes: "Korah, the son of Izhar, the son of Kohath, the son of Levi," making him the great-grandson of the patriarch Levi and the cousin of Moses and Aaron. Numbers 16:1-40 indicates that Korah rebelled against Moses along with 249 co-conspirators and were punished for their rebellion when God sent fire from heaven to consume all 250 of them. 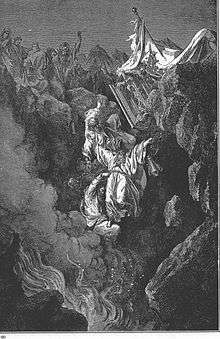 Korah's Reubenite accomplices, Dathan and Abiram, were also punished when God caused the ground to split open beneath their feet swallowing them, their families, anyone associated with Korah, and all their possessions. Numbers 16:41 Furthermore, the Israelites who did not like what had happened to Korah, Dathan, and Abiram (and their families) objected to Moses, and God then commanded Moses to depart from the multitude. God then smote 14,700 men with plague, as punishment for objecting to Korah's destruction. "Notwithstanding the children of Korah died not" (as of Numbers 26:11). The name "Korah" is explained by the Rabbis of the Talmudic era as meaning "baldness." It was given to Korah on account of the gap or blank which he made in Israel by his revolt (Sanh. 109b). Korah is represented as the possessor of extraordinary wealth, he having discovered one of the treasures which Joseph had hidden in Egypt. The keys of Korah's treasuries alone formed a load for three hundred mules (Pes. 119a; Sanh. 110a). He and Haman were the two richest men in the world, and both perished on account of their rapacity, and because their riches were not the gift of Heaven (Num. R. xxii. 7; comp. Ex. R. li. 1). On the other hand, Korah is represented as a wise man, chief of his family and as one of the Kohathites who carried the Ark of the Covenant on their shoulders (Tan., ed. Buber, Ḳoraḥ, Supplement, 5; Num. R. xviii. 2). The chief cause of Korah's revolt was, according to the Rabbis, the nomination of Elizaphan, son of Uzziel, as prince over the Kohathites (Num. iii. 30), Korah arguing thus: "Kohath had four sons [Ex. vi. 18]. The two sons of Amram, Kohath's eldest son, took for themselves the kingdom and the priesthood. Now, as I am the son of Kohath's second son, I ought to be made prince over the Kohathites, whereas Moses gave that office to Elizaphan, the son of Kohath's youngest son" (Num. R. xviii. 1; Tan., Ḳoraḥ, 3). Korah plied Moses with the following questions: "Does a ṭallit made entirely of blue wool need fringes?" To Moses' affirmative answer Korah objected: "The blue color of the ṭallit does not make it ritually correct, yet according to thy statement four blue threads do so" (Num. xv. 38). "Does a house filled with the books of the Law need a mezuzah?" Moses replied that it did; whereupon Korah said: "The presence of the whole Torah, which contains 175 chapters, does not make a house fit for habitation, yet thou sayest that one chapter thereof does so. It is not from God that thou hast received these commandments; thou hast invented them thyself." He then assembled 250 men, chiefs of the Sanhedrin, and, having clad them in ṭallitot of blue wool, but without fringes, prepared for them a banquet. Aaron's sons came for the priestly share, but Korah and his people refused to give the prescribed portions to them, saying that it was not God but Moses who commanded those things. Moses, having been informed of these proceedings, went to the house of Korah to effect a reconciliation, but the latter and his 250 followers rose up against him (Num. R. xviii. 2; Tan. l.c. ; comp. Targ. pseudo-Jonathan to Num. xvi. 2). 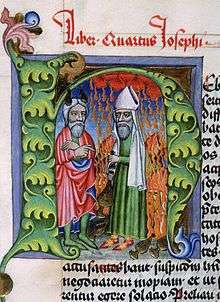 Moses and Korah, 1466 manuscript miniature, National Library of Poland. At the time of Korah's engulfment, the earth became like a funnel, and everything that belonged to him, even linen that was at the launderer's and needles that had been borrowed by persons living at a distance from Korah, rolled till it fell into the chasm (Yer. Sanh. x. 1; Num. R. l.c.). According to the Rabbis, Korah himself underwent the double punishment of being burned and buried alive (Num. R. l.c. 14; Tan., Ḳoraḥ, 23). He and his followers continued to sink till Hannah prayed for them (Gen. R. xcviii. 3); and through her prayer, the Rabbis declare, Korah will ascend to paradise (Ab. R. N. xxxvi. ; Num. R. xviii. 11; comp. Sanh. 109b). Rabbah bar bar Ḥana narrates that while he was traveling in the desert, an Arab showed him the place of Korah's engulfment. There was at the spot a slit in the ground into which he introduced some wool soaked in water. The wool became parched. On placing his ear to the slit, he heard voices cry: "Moses and his Torah are true; and we are liars" (B. B. 74a; comp. Tan., ed. Buber, Ḳoraḥ, Supplement).S. S. M. Sel. In the case of Korah son of Esau, both Esau and Korah waged war against Israel, and Esau was hated by God because of it according to Malachi 1:3. In these struggles, Korah became renowned as a warrior and a fighter, and was legendary in Canaan because of abilities. In the case of Korah son of Izhar, he is remembered for the rebellious action together with Dathan and Abiram against Moses according to Numbers 16:21. This story also appears in the Qur'an, where Korah is named Qarun (see Biblical and Quranic narratives). The story of this "fallen Levite" or "corrupted priest" is one of the many stories in the Scriptures that, in sharp contrast to most ancient literature, allows criticism of an honorable office, similarly to the criticism of King David's infidelity. Korah is mentioned in the 1768 edition of the New England Primer. Here, as part of an alphabet, we read that "Proud Korah's troop was swallowed up" which is a paraphrasing of Numbers 16:32.
declare that Cain derived his being from the Power above, and acknowledge that Esau, Korah, the Sodomites, and all such persons, are related to themselves. The Dead Sea Scrolls also provide additional details about Korah, though which Korah is not certain. Korah is also mentioned in the Quran by the name of Karun (Arabic: قارون Qārūn). He is recognized as wealthy, and became very arrogant due to his pride and ignorance. He gave the credit of his wealth to his knowledge instead of to Allah (God). Indeed, Qarun was from the people of Moses, but he tyrannized them, and We gave him of the treasures, that of which the keys would have been a burden to a body of strong men. The Quran states he was punished due to his extreme arrogance by being swallowed by earth along with all his great material wealth. In the Indonesian language, the term for treasure is "Harta Karun", meaning Karun's treasure. It is also often referred to in Turkish as "Karun'un Hazineleri". Korach (parsha), the weekly Torah portion in the annual Jewish cycle of Torah reading that tells Korah's story. ↑ Herbermann, Charles, ed. (1913). "Core, Dathan, and Abiron". Catholic Encyclopedia. New York: Robert Appleton Company. ↑ Worldreminder.com Archived July 18, 2011, at the Wayback Machine.